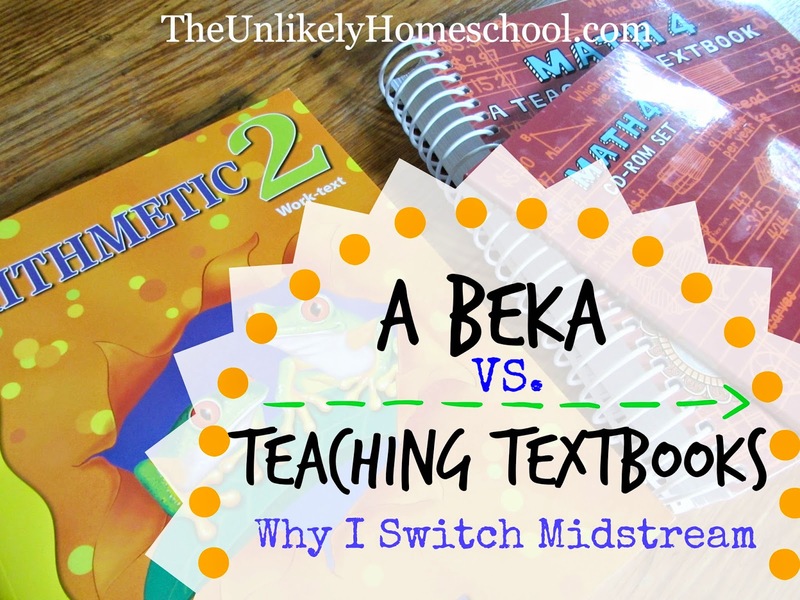 Why did you switch from A Beka math to Teaching Textbooks? How do you like Teaching Textbooks? And why are your younger kids still using A Beka? Naturally, I wanted to give Teaching Textbooks a full year before giving my "official" review. I switched because I'm a busy momma trying to juggle four grade levels and a toddler and quite frankly, something had to give! I needed an easier workload. In an attempt to lighten my load and maintain a certain level of school day sanity, I knew I needed to delegate one or two subjects to someone or something else. Although I was an "A" student in most of my math classes, it was never my favorite subject. Since, for the first four years of her education, it tended to be the subject that my daughter disliked the most also, it was the clear choice for CHANGE. The computer-based lessons of Teaching Textbooks would require little time from me freeing me up to teach something else to another child, I reasoned. So...That's the short answer of why I made the switch. The one I tell in passing to the lady with the raised eyebrows. But, you don't want the short answer, do you? You came here hopin' for the dirt. The nitty-gritty. Truthfully, if it wasn't A Beka, I would have to start with something else, because Teaching Textbooks only offers materials for third graders and beyond. But, I start with A Beka on purpose. I'm a firm believer that a child should learn all four math processes (addition, subtraction, multiplication, and division) inside and out...forward and backward. No counting on fingers. No memory tricks. Just memorization of the facts. In my opinion, if a child has to rely on anything other than quick memory to solve a process problem, he does not really know the answer...even if he can EVENTUALLY come up with the correct answer after using "tricks." Using finger counting or memory tricks really only affirm that a child knows what "addition" (subtractions, multiplication, and division) is. It doesn't necessarily show that he actually knows the individual facts. While a child can coast through life continuing to count on his fingers, I think that puts him at a great disadvantage in higher-level math. A long division problem, which should only take a few moments to solve, ends up being a thirty-minute nightmare. A weak foundation of math processes cripples a child down the road. Having taught A Beka in both a traditional school setting and in homeschool, I have always found it to be an exceptional curriculum for building core knowledge of facts from kindergarten through third grade. By fourth grade, those foundational facts are combined to create complex, multi-step problems. Perhaps it is because math has never been my fave, I really desire to add as much flair and color to it as possible. 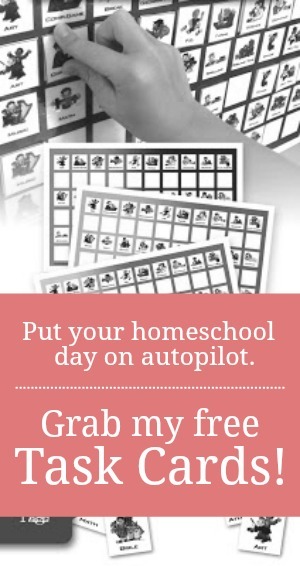 I'm not here to name names or anything, but most spiral-learning based math programs on the homeschool market today look like an absolute snooze-fest. No color. No pictures. Just pages and pages of black numbers on stark white pages. That's enough to make a clown cry, in my opinion. A Beka, on the other hand, is a workbook based-program that offers an aesthetically pleasing page...at least in the younger grades. Yes, it is workbook based. Yes, it often over-emphasizes review. But, since I have very distinct opinions about workbooks in my homeschool, I have no problem embracing the parts about A Beka Arithmetic that I like and ignoring the rest. That being said, I have never really loved the fourth grade and beyond A Beka Math. After third grade, the work tends to be rather dry and has an over-emphasis of long division. Once I made the decision to "farm out" math, I knew I needed to find a curriculum that would ALSO approach math from a spiral method, offer a great foundation in basic facts, and offer some flare! Teaching Textbooks immediately caught my eye. With a year of TT under my belt, here's what I've come to really appreciate about the program. All lessons can be repeated or played back should my kids not understand any of them the first time. The "worksheet" problems are self-grading. My child immediately knows whether he/she got an answer correct and can retry the problem or opt for a "hint" if need be. The first few problems of each lesson are practice problems and do not affect the daily grade. This definitely helps with a child who demands perfection from herself. My daughter was able to have a few tries at the new concept before being graded. It is CURRENTLY not aligned with common core standards. Here's a sample of Math 7, lesson 10. Although it is a spiral-approach to math, there is not as much review of old concepts as other spiral-method curriculums. When looking over Math 4 for the upcoming school year, I can clearly see that I will have to do some additional drilling of multiplication facts. They are taught. And it looks like they are taught well. But, I think most kids need more daily practice of the foundational facts than TT offers. The full package comes with both the CD program AND a traditional textbook/workbook. While I have friends who loooooove having the workbook because their children prefer to handwrite the answers, my daughter NEVER wanted to write in the workbook. For us, it was a waste of money. So, this year, I only purchased the CD package. Because Teaching Textbooks requires very little parent involvement on a daily basis, it can sometimes be tricky to help a child when he/she becomes confused or needs additional explanation. While I know math, I'm admittedly a little rusty on some math concepts that I just don't use very often in everyday life...like finding percentages and lowest common denominators. For this reason, I tried to listen in to my daughter's lessons every now and again in order to stay current with what she was learning. If I did not take the time to keep abreast of the units, it was difficult to help her. I'd have to go back and skim a few lessons in order to get the gist and be able to explain the concept more clearly to her. Every now and again, TT would teach a concept in a completely different way than I ever learned it...sometimes in a more clear, much easier way...sometimes not. I really don't like the way TT gives daily grades. A child is given two tries to get the right answer. So, even if my daughter got every single problem wrong the first time but was able to get them all correct on the second attempt, she received a 100%. That's not a clear representation of her ability, in my opinion. If she got it wrong the first time, I think she should be given a chance to re-do the problem in order to correct her mistake. But, I also think the problem should be marked as incorrect. The final grade should reflect the original error...sadly, it doesn't. Here's what I mean. You can see in this picture that my daughter clearly missed problem 21, and yet, she received a score of 100. The audio lessons can be quite long. For this reason, many kids opt to just read the lessons out of the textbook. They can skip the sections that they have mastered and focus their attention on the unfamiliar portions. As with all curriculums, both A Beka and Teaching Textbooks receive mixed reviews. People either love them or they hate them. I hope this lengthy look at why I choose to use BOTH has given you a better understanding of whether either one of these programs will work for YOU. Very informative, thanks. My son feels the same way about Abeka's 4-6 grades. Dry and repetitive, heavy emphasis on long division, and hardly any pictures (I wish they'd use more pics for the older arithmetic kids...they still love them). For grade levels 7 and up, is the review sufficient? Since by that time they've learned all their basic arithmetic facts & functions? I think they are more than sufficient BECAUSE they should have already mastered the processes. On the rare occasion that my daughter didn't do as well as I thought she should have on a lesson, I just had her redo the entire lesson the next day. I found this very interesting as we, too, use both! I only wish I hadn't switched until 4th grade because our daughter is not quick on math facts. But that's a daily review for us in other ways. I also wish daily math fact practice was included with TT. I really struggled with that choice for my son who will be starting TT in third grade (4th grade TT) instead of 4th. I think 4th is the IDEAL year to start TT which would actually be the equivalent of Math 5 or even 6 in TT. But, I need some additional wiggle room in my day, so I'm taking the plunge and starting him a year earlier than I had originally planned. I'm hoping I it goes well. I'm not familiar with either of these programs, but the way you've described it sounds pretty similar to our situation. In our early years, we used Spectrum workbooks (for more than just math, but mainly for math) that I picked up at Lakeshore Learning. Earlier this (calendar) year, we received a subscription to CTC Math (a review I did on my blog), which looks very much like the way you described TT: a video explanation followed by a digital worksheet. That's what we're going to use for this coming school year since our subscription is good through March. Come March, we'll figure something else out to finish up the school year. For math fact memorization, Learning Wrap-Ups are good. UberSmart Math Facts (a computer download) is good too. Depends on what your kids do better with, digital or physical products. Hmmm...I've not heard of either one of these programs. Thanks for sharing. Thank you for this information. I recently made the leap to put all of our kids in Abeka for 1- what I thought would be 6th, but now, I may do as you are doing... and switch to something else in 5th instead. I like Abeka for the repetition and the colors like you said. Plus the daily speed drills. I'm not sold on TT though... we'll see. Thanks for waiting to give your review till you had used the product for a year. It makes your review so much more detailed and helpful. Although I used the speed drills when I taught at a tradition school, I've never used them in homeschooling. We play lots of flashcard games, though. Either way, the daily practice is A MUST, isn't it? I bought the kids flashcards too. I have a kid in Algebra, a 3rd, two 2nds and 2 PK's in math (plus a baby on the way). I got flashcards that are self correcting and can be used to create piles of known and unknown, so they can work on them more independently... I hope I manage to actually *teach* the Abeka lessons well, they do seem a bit more time consuming, but my younger kids all need the spiral, colors, and daily practice. My older child started in Abeka 1, but we quickly discovered that he was going to speed through school, as he devoured the program in 4 or 5 months. So, he went to a Mastery program for his own sanity! and he is primarily a self teacher, especially in math. Thank you for this overview. I currently use ABeka and I was very close to switching my son to TT for this 4th grade year for the same reasons you've listed, but I could not get settled so I continued on with ordering AB. It may be a long year! It would be nice to have another "voice" i.e. the video teaching. So in your opinion, ordering one grade up has worked for your kids? That was one thing I couldn't decide on. I don't think it is that cut and dry. My daughter skipped two grades while my son will only be skipping one...for now. I think it depends on when you make the switch and what program you are switching from. Not to mention the strengths and weaknesses of your individual child. My husband is a computer/IT guy. He follows all the copyright rules "to the book." No illegal stuff. Thanks for all the great things you share on your website. Good to know. Thanks. One thing that I DO love about TT is that it is one of the rare CD based curriculums that allows you to resell it to someone else. My son just said to me, "Mom, remember to mention for your use only." I am not sure if you will see this but I wanted to find out how do I make a copy of the CD's. I purchased a used set and had to have them all resurfaced. I don't want my daughter scratching them up because I need them for 4 other kids still. I am using 2.0 version. Maybe you could only make backups with older versions, not sure. I'm switching my 5th grade son to TT's after lots of research and reading your blog/FB throughout last school year. He has been doing Saxon which is boring to me but he loves the repetition and no frills learning. It seems like he should be further along in math than Saxon allows with its slooooow pace. It is also really frustrating how he doesn't have a notebook and they don't give examples on the pages. Anytime he gets stuck on a problem we have to pull out the teacher's edition. With the switch, he is certain that he doesn't want to use the CD with TT. This means I will have to continue doing board lessons but he loves those and thinks it's fun to learn from me. (I guess that means I will have to sit up all night to teach myself 5th grade math this year!) I don't love that idea, but I have time for it, unlike you with your brude, I only have 3! Do you think it is a good alternative to the CD though? I have read mixed reviews on using just the textbook. Thank you for this terrific post! It is exactly the same lessons as what is presented on the CD. Personally, because the book is all in black and white, I'd think it would be rather uninteresting unless you were to really jazz it up with some fun games and review. But, it could be done. Good luck. Looks like you found something that works really well for you and your little one. Thanks for sharing. Im researching as to weather or not to make the switch from abeka to TT. Quit a few reviews I read said their children were fallen behind after TT. I have already reviewed the placement test and they would be 3rd grade but doing 4th grade TT. Some even said their children scored poorly on the end of year state test. (Im in NC) Both my children scored above average in everything last year on their standardized test.I would hate to change them and really regret it later. I just really love the thought of TT. Your input will be so greatly appreciated!! BTW the love Abeka math already. That's a really great question! Last year was the first year my daughter had to take a state achievement test since starting TT. She did just as well (well above average) as she did using Abeka. I think the key is to use the TT placement tests to determine what level to put your child into. Don't just assume that the grade level from Abeka will be the same as the grade for TT. But, that should be the case for switching any curriculum. I sure appreciated this post! We are doing Horizon Math now and love it, but I was thinking of switching to TT when we get to 4th grade, based on reviews that the Horizon isn't as strong after 3rd grade. I am excited about the possibility of doing in with the cd in place of a textbook, and I also appreciate your emphasis on taking a placement test. I bookmarked this review to read again in a year when I am shopping for 4th grade math...thanks! Yes. I would agree. 4th grade is the best time to switch. My son is currently in the 3rd grade material and I am having to supplement for multiplication practice. I appreciate this post a lot. I want to add something. Or two somethings. You might want to reconsider the textbook. We use it so I can physically see the mistakes my children are making and go over the instruction with them myself. Then I just plain don't need to listen in on the lesson because I have the instruction in front of me. Secondly, if a child corrects a missed problem and actually understands it the second time, even though they missed it the first time, they absolutely do deserve 100%! That means they mastered it and they deserve nothing less than an A. Then you proceed to the next lesson. Having said that, I don't make my children redo anything above a 90%, so their grades are all over the place at times. Anything below a 90%, we go over again until they understand it. I just wanted to put that out there. Thanks for all your hard work. I love your posts! Good points. My kids do their work in a spiral notebook so that I can still see how they worked the problem. But, I can see where the workbook would be helpful. Hi Jamie! I am so thankful to have come across your review as I was just trying to decide whether to switch my son from Abeka to TT. He is entering 5th grade and was always a math lover until 4th grade, when he began to claim that it was "boring". I think the Abeka math curriculum burned him out last year and your review helped me understand that a little better. My biggest concern about TT is that, as you said, it doesn't seem to teach at the same pace as Abeka. I will definitely use the placement test, but if he did well in Abeka for 4th grade, should I expect to buy the Math 6 TT for his 5th grade year, or do you think I should also test him on the Math 7? We are new to Teaching Textbooks and love it so far, except our brand new laptop (purchased primarily for this curriculum) is having trouble accessing the disks quickly/consistently/on the first try. My wife called the tech support and they hinted that there's away to copy the data to a hard drive to eliminate the need to put the disk in every time (at least that's how she took their answer), but he said he could not tell her how to do it. I've tried it (unsuccessfully) and I'm researching it further, but so far all I can find is other people with our same question, no answers. We had a little trouble once when we switched to a newer computer. They ended up walking me through the installation of a "patch." Maybe you can inquire about that. Quick question about building a strong foundation with math facts. What is the best way you've used for your kids to successfully memorize math facts? Do you sit daily for 10-15min and go through an entire deck of flash cards? Do you divide it up somehow, using only a part of the deck until it's memorized, then continue on? Thank you for your advice! My son in second grade has still not yet memorised his facts. I know it's not "too" late, but I'd love to hear how you've done it. I feel an urgency to teach him the facts! Thank you! We play a lot of review games with the flashcards and use online review games. Five minutes every school day. And little by little, they get it. Hi, I will be homeschooling for the first time next school year - my daughter will be in 3rd grade - and am wondering if she will be able to handle A Beka 3rd grade math after being taught Common Core up until now. She is very good at math & I very rarely have to help her with homework. But, when I have tired to help, she always says "that's not how I learned it" and tunes out anything I try to teach her. I'm afraid she will be "behind" learning math a way that is new to her. Thank you SO much for your blog! I will be a regular visitor here! That's a good questions, Tracy. My gut tells me that it might be a bit of a struggle at first because ABeka does math in the same way you would have learned it as a child...completely traditional. However, they follow a spiral approach where they go all the way back to the basics at the beginning of the year and review while adding on new material. I actually jumped into ABeka in jr. high when I was going through school. I had never, ever been taught any kind of grammar prior to that. ABeka Language Arts is very grammar heavy. I ended up getting As in grammar by the end of the first quarter. I'm assuming math would be the same way. TT now has an online component that is a fraction of the cost (between $50-70) for the course. It still records the grades and more. You can print out worksheets and quizzes etc too. The great thing is that they offer a free unlimited trial so you can try it out if you are on the fence, if you decide to purchase all the progress and grades will get transferred. This way you don’t waste money on a curriculum you don’t know if you are going to like. I printed out a placement test for my child rather than doing it straight online because in wanted to see his work and review concepts that he missed. So far I love it! Strongly recommend doing a trial though to see for yourself how the program is going to work for you. Yes, we've been using the TT 3.0 since last spring and have really loved it. It's streamlined our math time. Thanks for sharing your opinion too! It's always great to see that others like TT as much as we do.